Ryssen Alcools is known for producing alcohol of the highest quality which is tailored to the specific needs of the customers. To achieve this goal, we continuously improve all processes in every sector and department of the company. Ryssen Alcools takes pride in the satisfaction of our customers which is ensured by a rigorous quality management system. In our own lab on site we monitor production at all times and can make immediate adjustments so that our products always meet the highest quality standards. This is confirmed by the list of our long-time customers coming from a broad range of industries. They are the best proof of Ryssen Alcools' seal of quality. Under the supervision of the Quality Department, thorough tests are undertaken at each stage of the production. Continuous electronic and human controls guarantee a very high quality of rectification. Every single one of our products can be traced all the way from raw material to the marketed product. The constant taste is guaranteed by a taster-panel of seven specialists. 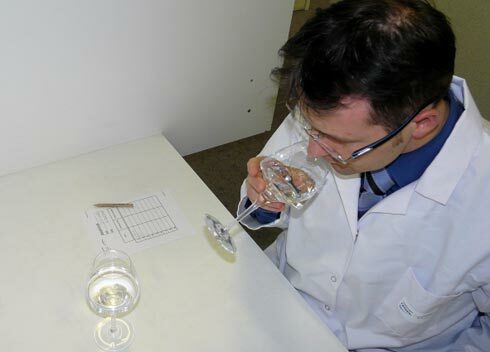 Blind tests are conducted twice a day to examine the organoleptic quality of the production and to compare it to selected standards. The production of Ryssen Alcools is certified according to ISO 9001 certified quality management system.